NAPLES, FL --February 25, 2019-- On Saturday, March 2, 2019, Steve Forbes, Chairman and Editor-in-Chief of Forbes Media, author of “Reviving America: How Repealing Obamacare, Replacing the Tax Code and Reforming The Fed will Restore Hope and Prosperity” and a Republican Presidential candidate will speak at the Law School’s Signature Event at an exclusive, private club in Naples hosted by Tom Monaghan, and John and Billie Resnick. For the first time, the law school is presenting the St. Luke Award for Distinguished Philanthropy to Mr. Tom Golisano, an entrepreneur and civic leader, and to Mr. Patrick Adams, attorney, public servant, and entrepreneur for their decades of generous philanthropic efforts. The event begins at 5:30 p.m. All proceeds benefit the Ave Maria Law Student Scholarship Fund. B. Thomas Golisano — entrepreneur, philanthropist, and civic leader — is the founder and chairman of the Board of Paychex, Inc. , headquartered in Rochester, New York. 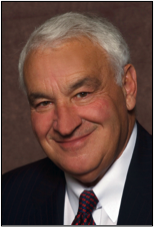 Mr. Golisano served as Paychex’s president and chief executive officer from 1971, when he founded the company, until October 2004 . Mr. Golisano has demonstrated an ongoing dedication and commitment to a variety of civic issues and organizations. In 1985 he launched his first philanthropic endeavor by establishing the Golisano Foundation , which awards grants to organizations providing opportunities for those with intellectual disabilities. His personal philanthropic contributions to hospitals, educational institutions and other organizations have totaled approximately $300 million.